In 2017 (5778) the Festival begins the evening of Tuesday, December 12th and runs through December 20th. Candles are lit each night at sunset to "publicize the miracle", starting with one on the first night, and ending with all 8 on the last night. Candles are usually lit from the right to the left (like how we read and write in Hebrew). 5:30 pm: Kabbalat Shabbat, potluck dinner at the JC3; Rabbi Mejía will lead service and Div’rei Torah. 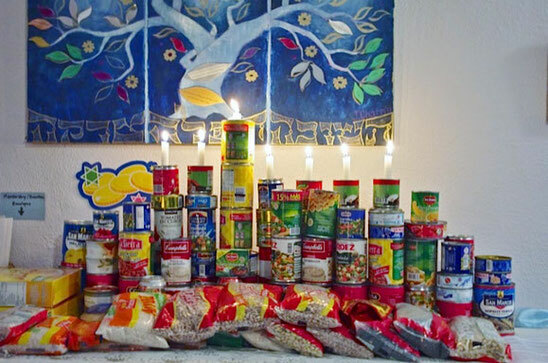 9:00 am: Shabbat Shacharit service featuring Bat Mitzvah of Luthien Ayon (elder daughter of Dr. Helder Ayón Flores, who will sponsor the festive kiddush). Torah Discussion Class (en español) to be led by Rabbi Mejía after kiddush. 4 pm: Annual Community Chanukah Party, with klezmer band (4:30-5:30), Mitzvah Menorah, dreidel tournament for the kids, latkes, etc. Chanukiot lighting at about 6 pm. 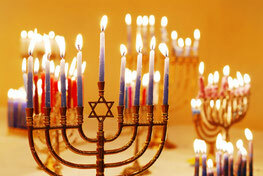 For more info on how to light the Hanukkah menorah/chanukkiyah, blessings, etc., please click here.